One of the most arresting of all Chinese Paphiopedilums, this species produces fragrant green flowers on stately inflorescences for maximum impact ! 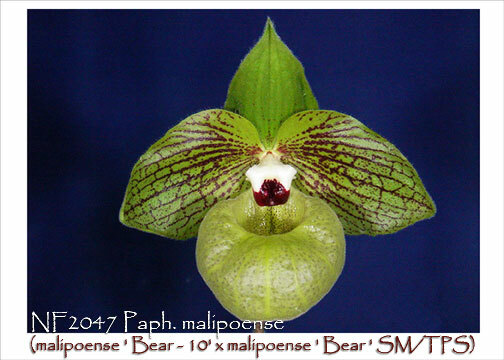 Mr. Bear selected his two most impressive clones to produce a generation exhibiting shapely green flowers with strong markings on its broad petals and dark green leaves heavily spotted with purple. Best grown in partial shade, similar to Phalaenopsis culture, its apple-raspberry fragrance is a delight. An intermediate to warm grower, it enjoys more water than many other Paphs so keep well watered at all times. For its amazing fragrance and color, this species deserves a place in every species collection !